We were recently invited to the launch of the ROG Rapture GT-AC5300 (Lowest Price) gaming router. 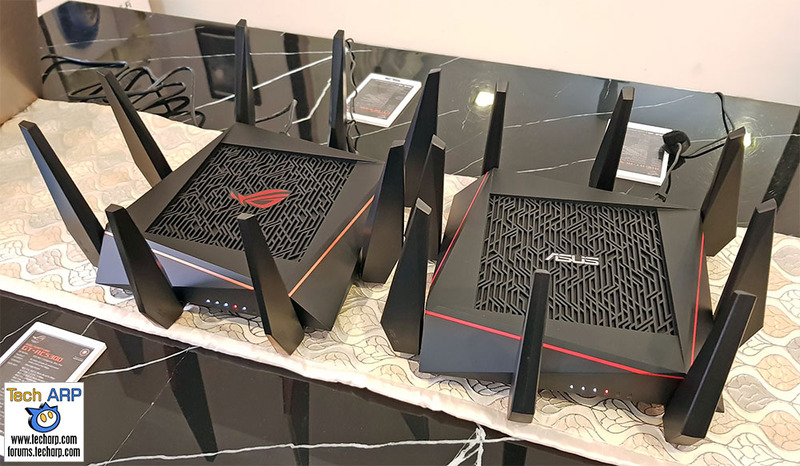 This is the improved, gaming-optimised version of the ASUS RT-AC5300 (Lowest Price), which is affectionately known as the “alien spider” router. They both look identical, but the ROG Rapture GT-AC5300 gaming router boasts a number of improvements. Let’s take a look! The ROG Rapture GT-AC5300 (Lowest Price) is a tri-band gaming router that is based on the famous ASUS RT-AC5300 (Lowest Price) “alien spider” router. Let’s hear from ASUS what are the improvements in this Republic of Gamers (ROG) router! We also had the opportunity to take a quick look at the ROG Rapture GT-AC5300 (Lowest Price), and compare it to the ASUS RT-AC5300 (Lowest Price) which looks almost identical. The key differentiating features externally – the ROG and ASUS logos, and the number of LAN ports – the ROG router has 8 LAN ports, while the ASUS router only has 4 LAN ports. The ROG Rapture GT-AC5300 (Lowest Price) provides two gaming LAN ports that are optimized for gaming devices. All traffic on these ports is given top priority, so your gaming devices — or any other devices you want to connect to these ports — are always at the head of the internet queue! ASUS Game Boost analyzes network traffic and prioritizes gaming packets, giving games a second level of acceleration for the best possible performance. Game Boost can be activated instantly with a single click on the Gaming Center dashboard, and it supports many consoles, including PS3, PS4, PS4 Pro, PlayStation Vita, Wii U, Nintendo 3DS and Xbox One. The ROG Rapture GT-AC5300 (Lowest Price) has built-in support for the Gamers Private Network, powered by WTFast, which provides private, optimised internet connections to game servers, minimizing ping and latency to ensure smooth, lag-free gaming. To defend your network, the ROG Rapture GT-AC5300 (Lowest Price) features Game IPS (Intrusion Prevention System), powered by Trend Micro. It protects your gaming network from external attacks and threats, neutralizing them before they can reach your network or devices. Even if your PC’s security software isn’t turned on — to get around blocked games, for example — Game IPS still protects your network from attacks and intrusions, giving you added peace of mind. The VPN Fusion feature lets you run a VPN and an ordinary internet connection simultaneously! So even if other network users need to use a VPN, you can still enjoy maximum gaming speeds. With the ROG Rapture GT-AC5300 (Lowest Price), you can easily allocate one of the two 5 GHz bands to gaming devices, while other devices use the second 5 GHz band or the 2.4 GHz band. The RangeBoost feature is a powerful range-enhancing combination of hardware and software that increases coverage while also significantly improving long-range throughput! The ROG Rapture GT-AC5300 (Lowest Price) is powered by a 1.8GHz 64-bit quad-core CPU that is more than powerful enough to handle anything you can throw at it, without skipping a beat. Next : The ASUS Lyra WiFi Mesh System Revealed!